I used to have a whole long list of webcomics that I would read religiously. Some of them I caught onto in the beginning; others I saw and went back to the beginning, spending hours catching up on the archives. For a couple of years now, I haven’t really kept up with most of them, finding I don’t really have the time to read so many of them, what with all my Facebooking and video gaming and online board gaming and offline board gaming and… well, you get the picture. There are two, however, with which I do try to stay au courant. One of them is John Allison’s Scary-Go-Round, which follows several characters – some school children and some adults – through adventures great and small, bizarre and mundane. The school kids, in various combinations and permutations, have solved odd mysteries in their small English town of Tackleford. The adults have had their own strange and wonderful stories. I would not do them justice by trying to write synopses, so I will just say click the link above, or better yet, start with Bad Machinery, which introduces Jack, Sonny, Shauna, Mildred, Charlotte (aka Lottie), and Linton on their first day at Griswalds Grammar School; then follow all their cases. Or scroll down and look at the other archives – the original Scary-Go-Round, or the two “Bobbins” series. It’s a thoroughly enjoyable rabbit hole to fall into. The other webcomic I am most enamored of started out as a not-web comic, but its creators have moved it to a webcomic format and have been putting all the back issues on the website. I speak, of course, of the Wonder and Glory that is… Atomic Robo. This has it all: humor, adventure, nefarious villains, action scientists, the robotic progeny of Nikola Tesla. It is impossible to catalog all the ways this book makes me happy. Here’s how much I love Atomic Robo: I don’t do cosplay, but I am seriously considering designing, building, and wearing an Atomic Robo costume. (Which doesn’t sound like much, but it has become more than just a fleeting “Oh, wouldn’t that be cool” kind of idea. It’s an idea that has sunk its tendrils into my brain, and won’t let go.) 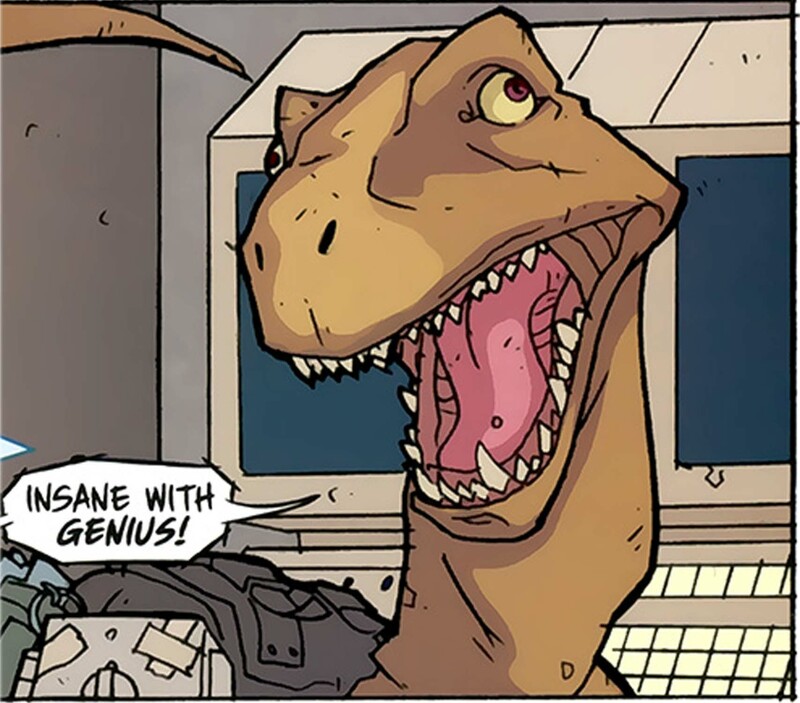 Last Saturday being Free Comic Book Day, there was, of course, a free Atomic Robo comic (although really, now that they’re on the web, they’re all free, but the FCBD 2015 story isn’t all available online yet – I got it via Comixology), starring my favorite villain, Dr. Dinosaur. Posted on May 7, 2015 May 7, 2015 by dansomeonePosted in Comics, Culture and StuffTagged atomic robo, bad machinery, dr. dinosaur, scary-go-round. Next Next post: What we’ve got here… is failure to communicate. I have just spent an hour reading webcomics in my underpants and my latent anglophilia has returned from remission riding a flaming Vespa. Do you never consider the consequences of your link-sharing?! ?